As before, the full source is posted for you to browse as well. This entry was posted in Mozilla, Security, Web Development on January 20, 2011 by bsterne. For instance, today I learned that ReCAPTCHA loads script both from api.recaptcha.net, but also from www.google.com. Note to self: figure out why Google needs to know about every ReCAPTCHA load. If you find it useful, drag it to your bookmarks toolbar and you can use it from any web page. Feel free to check out the bookmarklet source as well. In the future, I would like to add notifications for potential inline script violations. This entry was posted in Mozilla, Security, Web Development on October 14, 2010 by bsterne. One of the new features in Firefox 4 is the App Tab which lets users persist a tab that they use continuously. Firefox shrinks the tab down to just the favicon and places it in a special area for these tabs which generally aren’t closed by the user. The feature is great, but one of the side effects is that Gmail App Tabs don’t show anymore the part of the <title> that indicates unread messages. That’s where my new Jetpack (a cool new, lightweight (and secure!) way to write Add-ons) comes in. 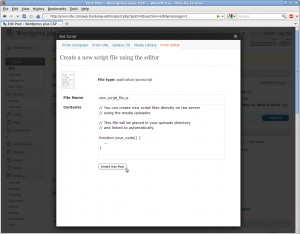 This entry was posted in Mozilla, Programming on August 13, 2010 by bsterne. My implementation of the Content Security Policy server logic for WordPress is now available as a WordPress Plugin. 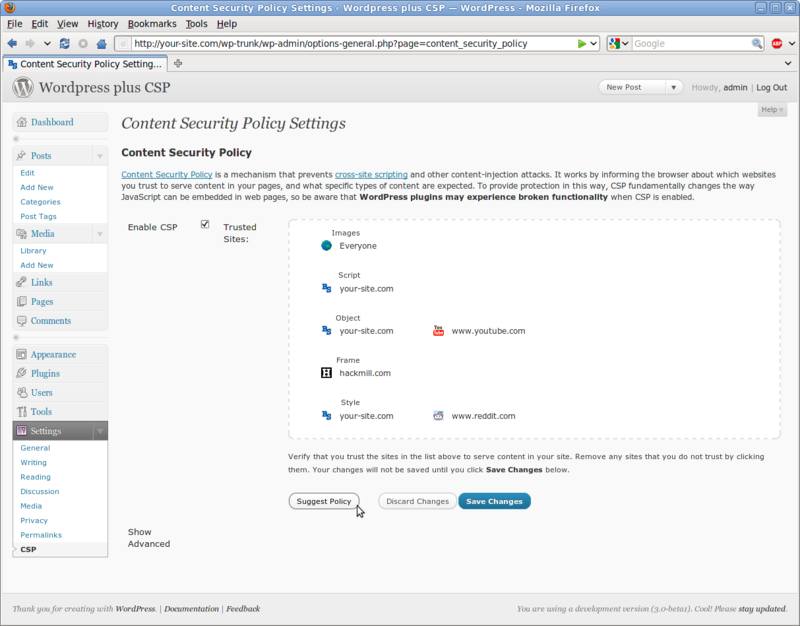 Fig.1 – CSP configuration page making a policy recommendation. Fig. 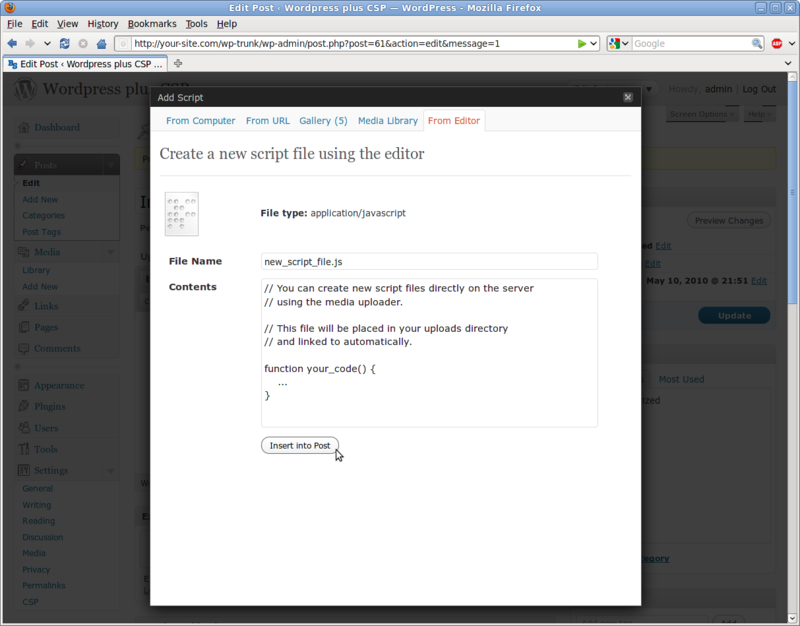 2 – New panel in media uploader allows direct creation of script files in the uploads directory. This entry was posted in Mozilla, Web Security on May 28, 2010 by bsterne. Lately, I have been implementing the server logic for Content Security Policy in WordPress. I was very pleased to see that the WordPress community opened up the tracking bug for this feature around the time we first blogged about it. One of the neat things about working for Mozilla is that contributions to other important open source projects are treated as valid, valuable uses of our time. Today, I posted my first patch to WordPress, still a work in progress, which adds an administration panel (see below) for configuring CSP. One of the features I’m rather happy with is “Suggest Policy”, which analyzes the content in the user’s blog and recommends a policy based on the content types and sources it finds. Next I’ll be working on moving the remaining inline script into external script files. Stay tuned for further updates! This entry was posted in Mozilla, Security, Web Security on April 12, 2010 by bsterne. I posted this over at the Mozilla Security Blog but wanted to share it here as well. 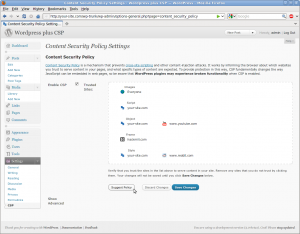 I am excited to report that Content Security Policy is available for testing! We’ve been working hard on implementing the CSP spec and now the new features are ready to be put to the test. Once you have it, you can test the core functionality of CSP at the demo page I set up on my Mozilla web space. There is a lot more information about this project there and I look forward to any feedback you have to share with me. This entry was posted in Mozilla, Web Security on October 1, 2009 by bsterne.